The Bureau of Land Management (BLM) recently let us know that they’ve repaired as much of this damage as possible and are taking steps to (hopefully) prevent it from happening again. The Table Rocks – both Lower and Upper – have been favorite year-round short hike destinations for us ever since we moved south. One of the many pleasures of these hikes is to observe the seasonal round of the vernal pools that are unique to these locations. These pools are a rare habitat that supports a Federally-listed threatened species of fairy shrimp and a state-threatened plant called the dwarf wooly meadowfoam, a flowering plant currently, and historically, only known to exist around the edges of these pools. The existence of these rare species and their habitat is what caused the Table Rocks to be designated as an Area of Critical Environmental Concern by the Bureau of Land Management (BLM). 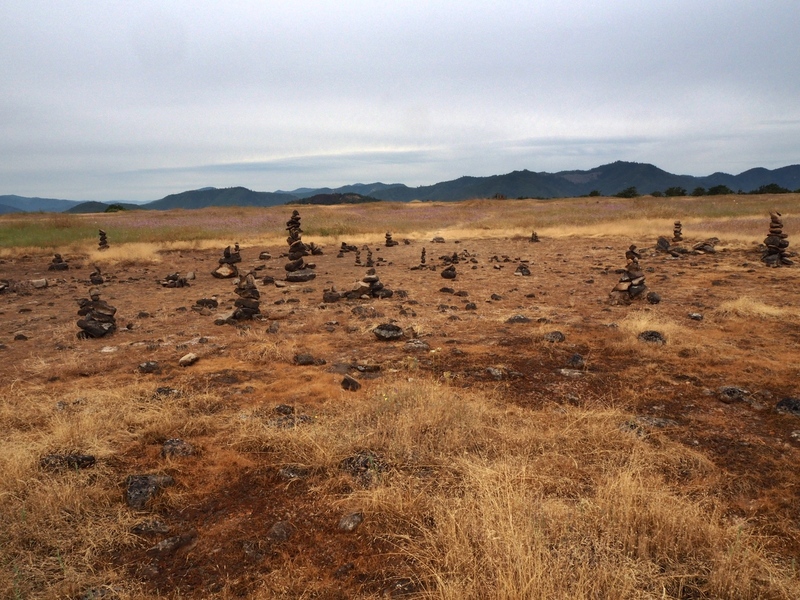 During a hike today on Lower Table Rock, the LovedOne and I noticed what looked like posts off to the left of the trail about halfway to the South Viewpoint. 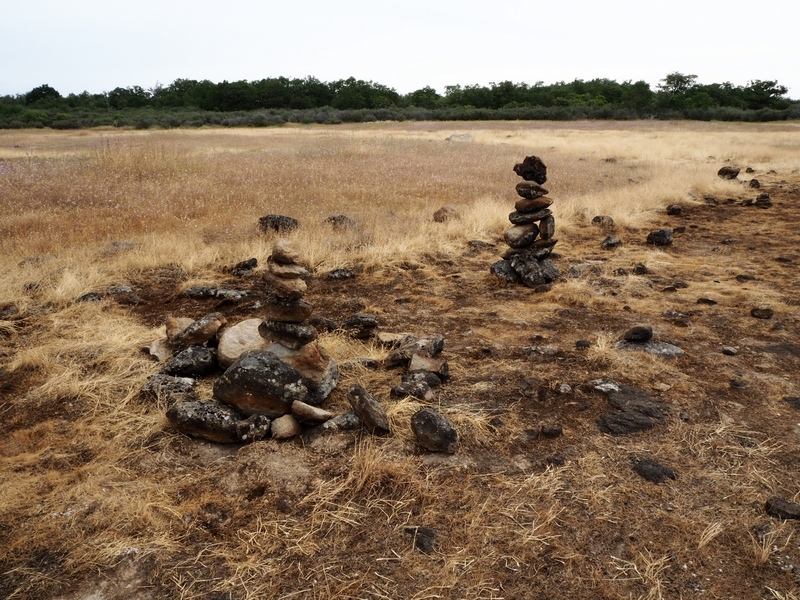 On closer inspection, these proved to be rocks stacked into spires or cairns between a foot and four feet tall and placed all over what used to be one of the largest vernal pools. There were also stacks and rock walls built in the remains of the smaller vernal pool to the south. Whoever made these abominations had dug the rocks out of the pools and, in the process, had destroyed the pool bottoms, which the plants and animals, found nowhere else but here, need to survive during the dry summer months. Aside from selfishness and stupidity, we have no idea what motivated the cretinous vandals who unleashed this destruction nor do we care, as there is simply no justification, whatsoever, for this wanton desecration of these rare and unique natural features. We’ve reached out to both the Bureau of Land Management (BLM) and The Nature Conservancy – as they manage different parts of the Table Rocks – about this situation and we hope that they will follow-up on the federal and state crimes committed here. Whether restoration is an option, or whether the destruction has just been too great, remains to be seen. In the end, to have come upon something like this in a place we’ve come to cherish, is sad and disheartening almost beyond imagining. I’ve seen this behavior all over. I remember Niecie investigated a pile of rocks just like these in Arches National Park. I think that a lot of people have a hard time understanding how a darker pile of what looks like dirt along the trail side can be endangered (an example from arches). Great pictures. I hope you enjoyed the hike despite this discovery. Also thank you very much for telling people about this behavior so that it can stop. OH this is so unfortunate, thank you for sharing despite the sadness. It’s good to educate the rest of us on stuff like this. This is horrible. Desecration of anything is never a good thing, but, when it is a spot that is so necessary to survival, it makes it especially horrendous. As for the rock formations. It would be good to find out why, because that would lead to who. Since these have been going on for over a decade, there is definitely a reason, when looked into, it may just deliver the who. I am assuming that these are only in one area, as I have never seen them anywhere here, in the East and they were not present in Utah, when I was stationed there. (1988 – 1990) We did a lot of camping out there. I hope they are found and that this type of destruction is stopped. Also, others who read this may see something that can help. I doubt we’ll know who unless there are photos on Instagram. Cairns used to be a pretty scare – but more out here in the West than back East – but it seems like in the last few years they’ve proliferated all over the place. What once were useful trail guides have morphed into visual pollution or, like here, destruction of a rare resource. 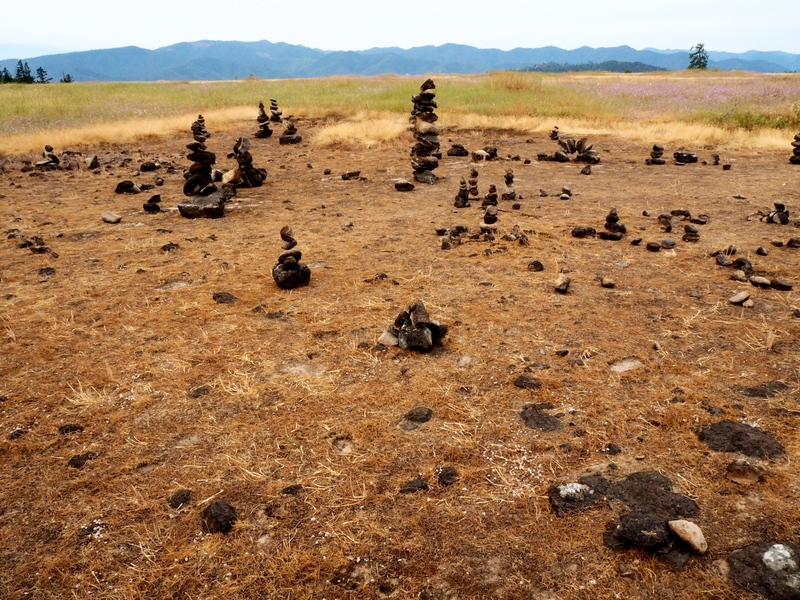 We have also seen many of these cairns over the last year. That’s terrible that they went out into the vernal pool areas to make them, but it is not a surprise. As others have noted, we have seen people with dogs, walking along and through vernal pools with water in them, and creating their own new trails when we have hiked both Table Rocks. Too often these folks are grown ups with kids along and instead of teaching them to value and enjoy nature while following the rules so all can enjoy, they just have to go “off” trail to get closer to nature. Maybe the BLM needs to patrol or better monitor these two sites. I’d like to see a little more BLM presence up on the Rocks but, given their budget and staffing constraints, that seems unlikely. It really only works if people take responsibility upon themselves to enjoy nature without feeling they have to “rearrange” it to suit themselves. I am getting really tired of these balanced rock totems popping up everywhere I go. About ten or so years ago, there would be a few here and there and it seemed quaint. Now they have proliferated and mar many, many places, at least around Mount Shasta. I guess it is some attempt to be “in harmony” with nature or in balance with nature but, as you observed, they are anything but. I knock them over now. Let the wild be wild. We’ve noted this proliferation too, to the point where we’ve found them in the middle of an obvious trail! So we usually knock them over too, unless we know they mark a key trail junction or directional point. This case was different in that their construction involved destruction of rare species and their critical habitat and may have violated federal and state species protection laws. So we left them as evidence so the BLM and/or Nature Conservancy can, we hope, take appropriate action. Overall, how one gets in “harmony” with nature by destroying it still totally eludes us. We noticed them on the 9th ( That’s part of our next post). Just in our short visit we saw on young guy with a fist full of flowers, a couple with a dog at the end of the airstrip and another guy crashing through the brush chasing an alligator lizard on the way back down. We watched him grab a handful of poison oak during the chase so hopefully there is a little karma for that one. It’s so sad. We hope whoever did this damage takes a major hit in their karma and earns another (well deserved) turn on the Great Wheel as a cockroach.